Good Day of Dry Fly Fishing….. Sat. July 27, 2013….. After a dry week, well a few dry days the storms returned and we had some early thunderstorms on the South Holston that threatened our day. I guided Dr David Spivey and we had a good day despite the severe weather start and on and off storms the first part of the day. The sulphur hatch began in earnest and we got three good flurries of them for about an hour and a half each before things started to wind down around 530pm. At least 40 fish today all on dries…and probably half as many on that came off. 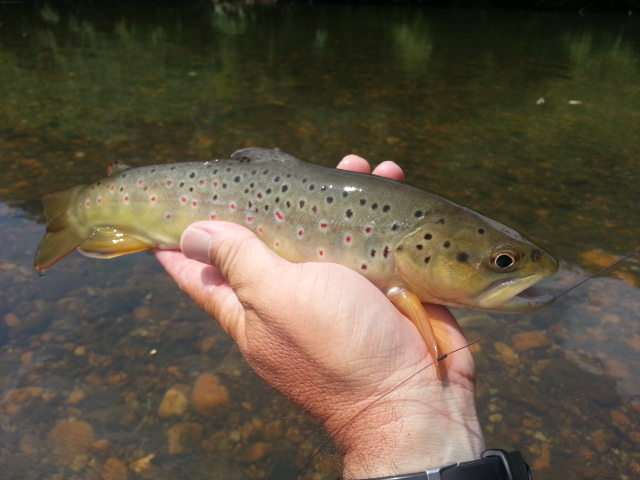 Used an entourage of new dry fly patterns and two of them the fish took very well. In fact one of them we caught 20 of the 25 fish we cast to with it. A new emerger pattern Nd it smokes em. Will be spending a couple days fly tying this week, doing a couple of guided trips, then its off to Teton Country….the Wilds of Wyoming for our annual August trips there. Should be a great trip…its hopper time…..
Great Morning on the Smith…. Tues. July 23, 2013…Nice morning on the Smith R, guiding Hayden Roe and his brother Jake. 15 yr old Hayden I have now watched nail 4 rising browns on flatwater on a dry. Its going to be a good day…. 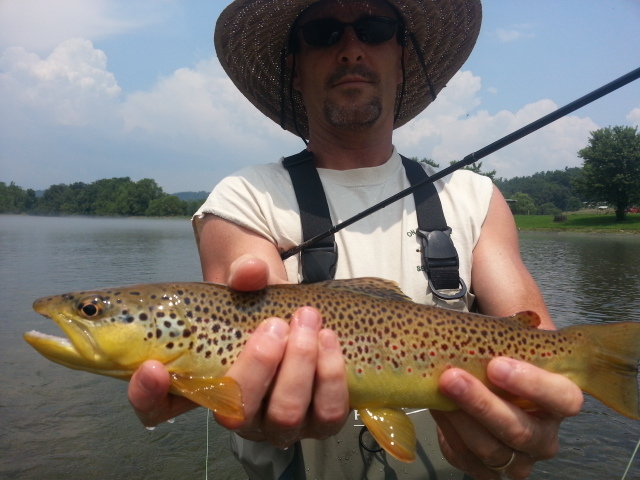 The dry fly fishing here has been stellar…..and no other anglers. Had some great beetle action so far this morning. Landed 4 of the first 6 fish we cast to. One of the others broke off and got in a tangle of limbs….nice fish. Probably a 16in brown…..very nice indeed. 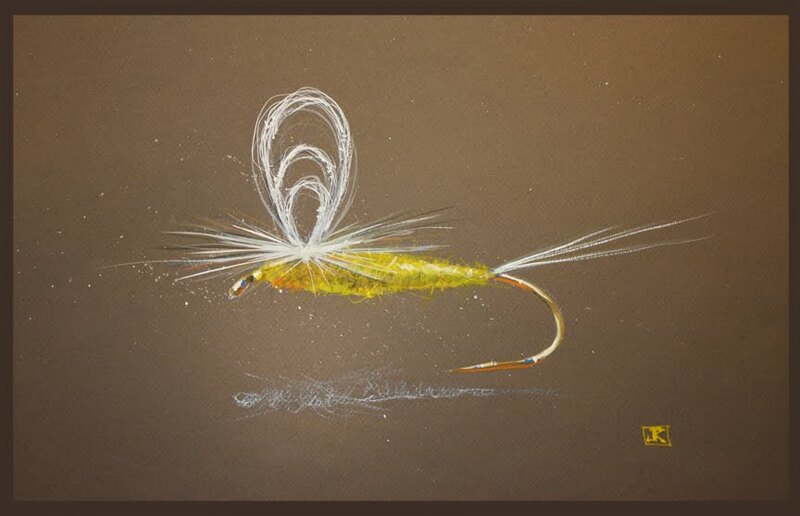 You can get in on this action…..i know where to find it ……Lets go fly fishing! Sat. July 20, 2013….What a good week it has been, wrapping up a great week of dry fly fishing and the SoHo has provided some great action all week. Spent 4 full days there guiding clients and we did well…some days Sulphurs, some days a mixed bag…every day we got some terrestrial action . Beetles have been the ticket. Doing a group trip on the Smith today with Bill Flinn, German Ydrovo, Jon Clift and we have done well catching a good many fish on dries…Sulphurs, craneflies, and beetles. Beetle fishing is in full swing. Several great and awesome takes…..
Have a great one, more to come….! 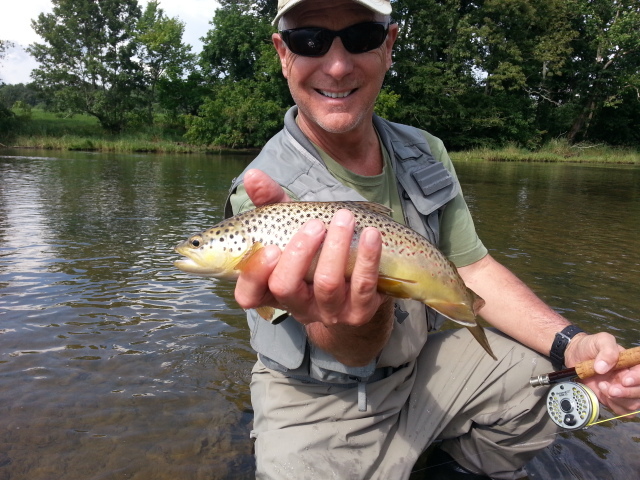 Wed. July 17, 2013….After so many rainy days it was great to get in two excellent days of dry fly fishing. Had a stellar day yesterday with Dr Tom Wolff of Winston-Salem, NC and Tom put probably 30-35 fish in the net. We caught fish on a variety of patterns. ..mostly dries…sulphurs, midges, and beetles. Had a repeat today with Jeff Chalmers of Summerfield, NC and we smoked ’em landing about 45 to 50 total and all but a couple were on dry flies. 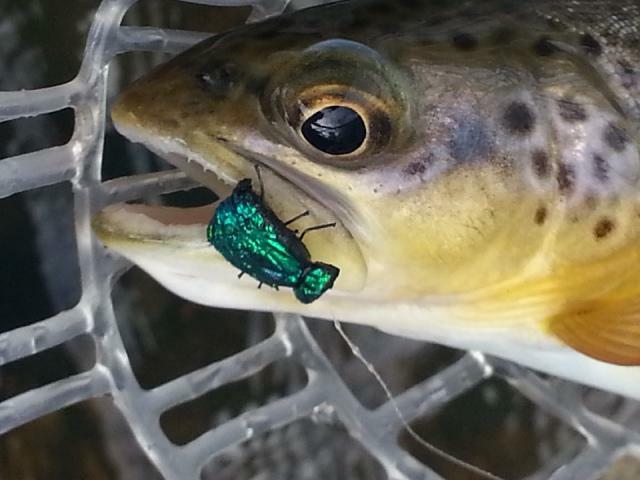 Sulphurs even though the hatch was light…..also got in some beetle time as the fish took them well the past two days. 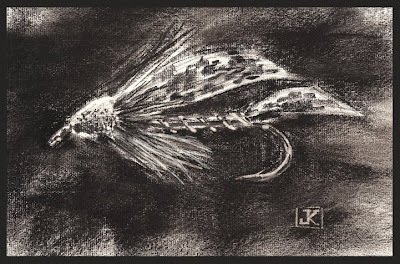 At times today the dry fly action was terrific….hoping it continues. We fished til about 4pm until a massive thunderstorm complete with some deadly lightning ended our day. Unbelievably heavy rain…. Have a lesson with some of the guys from Wyoming as well as prepping for some upcoming trips….